I have been patchwork and quilting now for twelve years but have sewn since the age or four. Whilst at high school I did a textiles project for my Art GCSE coursework which involved making a small final piece. After visiting the knitting and stitching show in Harrogate with my mum that year I was inspired by Margaret Beale’s technique to create my art work in fabric. My finished wall hanging won the under 16’s category at Harrogate in 2005. I was hooked. After school I went on to study A levels in Art, Graphics and Maths. Being a young one in my year with a late August birthday I didn’t want to make the big step to university when I also wasn’t sure what I wanted to study. Instead I enrolled at Blackpool & the Fylde College to do an Art Foundation course. It was here where I specialised in textiles and was encouraged to bring my hobby into my college work. After completing the year I was accepted onto the Embroidery degree course at Manchester. That year my Mum opened up our Patchwork and Quilting shop Quilter’s Quarters and I began working in the shop at weekends and holidays when back from university. Whilst working in the shop a few of our customers encouraged me to look into long arm quilting. After I graduated we bought a long arm quilting machine and in January 2012 I began professionally quilting at the shop. I have a wonderful customer base who keep me in the best job doing what I love. 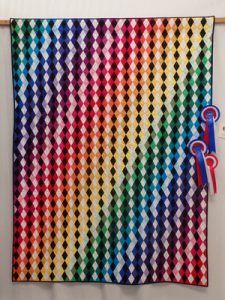 This year at Quilts UK my quilt ‘Prism of Light’ was awarded 3rd bed quilt, the piecing award and the traditional patchwork award, also my Mum was awarded 1st in the bed quilts and overall champion with her quilt ‘Starburst’. Mum’s quilt was also awarded the Long Arm Quilting Award which is the first award for long arm quilting I have received made all the more special that it was pieced by my Mum. We share the same passion and work together doing something we both love – we are both very lucky! Two years ago I embarked on a hand pieced hexagon quilt which I was challenged by my boyfriend’s Gran to complete in time for the Harrogate Show. Considering I was first introduced to paper piecing aged around 10 and which I hated, I think I surprised us all to actually complete it in time. All 4537 hexagons! Naturally when I completed it I felt bereft as I love to hand sew in an evening. So then I started ‘Prism of Light’ I opened a jelly roll of plain fabrics and added a couple more colours to it. I don’t usually plan my quilts – I cut diamonds of each colour which I originally intended to sit on black. But it turned out that black was too dark, but white was too light. Using both seemed to bring the perfect balance and then my quilt was born. It symbolises both my love of colour and also my need for order as most of my quilts do.